After engaging UX with research buyers, ResearchPool has re-delivered more advanced and friendly dashboard & report page. 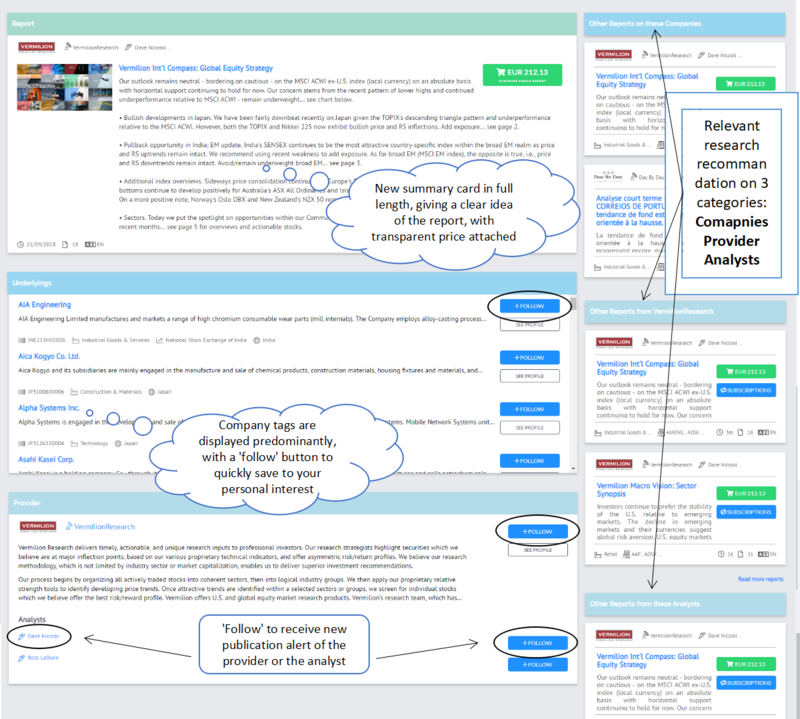 New reading page make it easier to browse reports, select what to read with key meta data display and quickly find related publications! In a premium report, summary card plays a crucial part in demonstrating the report content. For a research buyer, the first thing that comes to their sight would be the abstract of the report, which helps them decide their interest in the purchase. Therefore correctly abstracting the report, emphasizing on a few points that differentiate your reports will attract great attention from buyers. The underlyings that attach your content to our searching system is also of great importance, for buyers to quickly find your reports. Displayed predominantly under the summary card, companies’ information are clearly listed and categorized, and can be followed right away. If research provider always tag the right companies covered by their reports, users will first have a clear idea of the coverage when browzing through report page. Moreover, reports will always show up with their tagged companies when being searched and being followed. Related publications will be displayed inside the new report page! This function will help increase readership, as we installed 3 categories of recommandation to expand the length of reading. The latest reports covering the same companies will help users further explore and compare fresh contents. The latest reports from the same provider, and more specifically, the same analyst, will also be recommanded. This will bring great value to providers as buyers’ interest grow on your profiles by browzing through several reports. Reports are now directly displayed with their unique prices! Users can purchase with one click, and quickly identify their options (pay per report or subscription), making it much easier to take purchasing decisions! Every providers are encouraged to put their prices on reports now – as reports cards with clear pricings are drawing much more attention on marketplace! Flexible distribution models help seamlessly monetize your reports! Besides a single price per report, you are also able to put them under different subscriptions based on their coverage, or analysts — only within a few seconds! When uploading reports, providers are now encouraged to set up a price per report, whether by manually adding it through ResearchPool provider portal, or including it in the automated RIXML file. Afterwards, using provider portal to set up subscriptions is also as easy as it can get. Simply use the filter to define the report flow, and all reports under the same criteria will stream to a subscription feed! Now, apply different pricing models for your research to provide several unrejectable offer to clients! ResearchPool reserves all rights to final interpretation.